844-448-9797 | Energy Savings Guarantee | Search now.. While the iZ Automation System runs in the PLC environment, the iZ Systems Data Acquisition software runs in a separate partition in a Windows XP environment to provide customized data trending functions which can be configured instantaneously with a mouse click. All parameters known to the processor are trended including compressor status, system pressures, system rate of change, etc. Additionally, the standard programming calculates flow and power for each compressor and using the rate of change of pressure in storage accurately calculates total system flow and total power based on predetermined compressor performance values. Additional analog instrumentation is easily accepted to provide real time monitoring of these parameters with current transducers and flow meters if desired. Because the iZ Data Acquisition software runs in a discreetly partitioned Windows XP environment, it is easily interfaced to provide all recorded data to virtually any plant DCS or MIS software including Wonderware, Intelltuion, RS View, etc. The exclusive Cell Modem technology allows iZ’s compressed air professionals to maintain peak performance in the system for the long term. 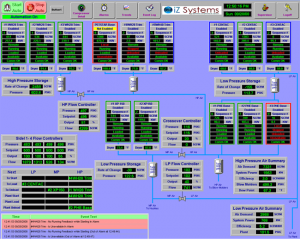 Additionally, the iZ Data Acquisition software is easily expanded and is very scalable so it can become the backbone for a plant wide data system for all facility equipment such as chillers, boilers, pumps, cooling towers, etc. On line demonstrations of this capability are available upon request. The Overview Screen is a process flow schematic of the supply system storage and header pressures which displays individual compressor status, power and flow to provide a snapshot analysis of the system’s operation. Total system flow, Power, Efficiency and Pressure are summarized in a table for a snapshot of system status and performance. This particular screen displays the systems triple routine capability controlling 3 separate pressure systems and coordinating them for optimum efficiency and reliability. 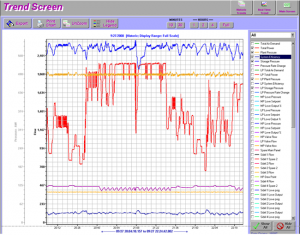 The Trending Screen displays a real time or historical graph of all known system parameters including information on system pressures, total power, flow, system efficiency, and other parameters. This will allow the plant to track operating costs, energy consumption, and system efficiency to detect any condition which causes a loss of efficiency or performance. The Edit Group Screen provides the interface for configuring each pressure system without requiring programming changes in the automation software. Each systems parameters are fully functional from a logic, sequencing, rate of change point of view. All values are available for tuning from this screen to allow each system to setup for optimum efficiency without impact the other compressed air systems in the facility. All values are setup and recorded by iZ technicians during startup but can be easily modified if required with appropriate password protection. The Compressor Setup Screen provides the interface for configuring each compressor in the system without requiring programming changes in the automation software. All required interface parameters including timer settings, pressure limits, etc. are preset by iZ technicians during startup but can be easily modified if required with appropriate password protection. The compressor setup screens are designed to provide the flexibility to configure different types and sizes of compressors without programming changes. 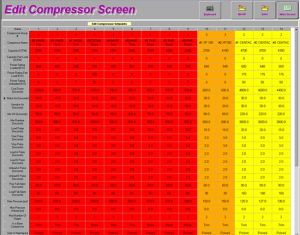 The Compressor Diagnostics Screen provides the interface for confirming the status of and testing each compressor in the system. Timer status can be confirmed as well as checking maintenance timers if enabled. The compressor can be taken into manual mode for testing and verification of interface components for proper operation. The Love Controller or Pressure Flow Control Screens (quantity not limited) allow the IZ automation to adjust setpoints and tuning on all control valves in the compressed air systems. 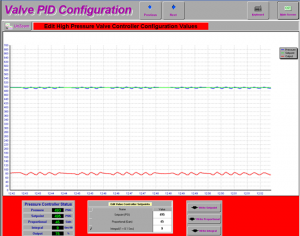 The graphs of the valves response to process setpoint and process variable allows for the most accurate tuning without control hunt. Note that IZ Systems always provides a separate electronic PID Loop controller for Pressure Flow Control valves because, when the automation is down for service or upgrades, that is when the air system most needs the valve to remain operational. The Analog screen displays a real time or historical graph of all known system parameters including information on system pressures, total power, flow, system efficiency, and other parameters. This will allow the plant to track operating costs, energy consumption, and system efficiency to detect any condition which causes a loss of efficiency or performance. The benefits that our technical support staff can provide can reduce operation costs, increase productivity and in turn increase the quality of the final product..